This work is intended to portray the interrelationship of heredity, individual development, and the evolution of species in a way that can be understood by nonspecialists. In striving to offer a straightforward historical exposition of the complex topic of nature and nurture, the author tells the story through a central cast of characters beginning with Lamarck in 1809 and ending with a synthesis of his own that depicts how extragenetic behavioral changes in individual development could be the first stages in the pathway leading to evolutionary change. On the way to that goal, he describes relevant conceptual aspects of genetics, embryological development, and evolutionary biology in a nontechnical and accurate way for students and colleagues in the behavioral and social sciences. The book presents a highly selected review as a prelude to the description of a developmental theory of the phenotype in which behavioral change leads eventually to evolutionary change. *to show that this somewhat unorthodox manner of conceptualizing heredity and individual development gives rise to a new way to think about the behavioral pathway leading to evolution. In conclusion, the present work will provide a contribution toward the possible dissolution of the nature-nurture dichotomy, as well as a contribution to evolutionary theory. Contents: Conceptions of Development: Preformation and Epigenesis. Lamarck and the Idea of the Evolution of Species. Charles Darwin on the Evolution of Species and the Role of Embryological Development. Ernst Haeckel and the Biogenetic Law. 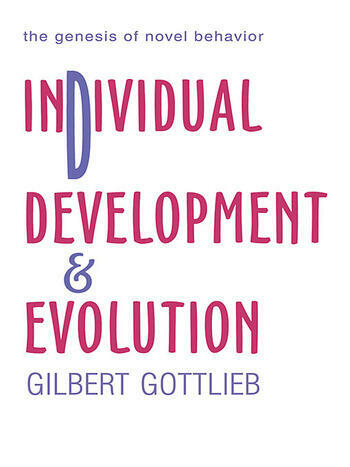 St. George Mivart: First Intimations of the Role of Individual Development in Evolution. Francis Galton: Nature Verus Nurture, or the Separation of Heredity and Environment. August Weismann, Wilhelm Roux, Wilhelm His, and Hans Driesch: An Abortive Attempt to Understand Heredity Through an Experimental Approach to Embryonic Development. Karl Pearson Versus William Bateson: The Foundation of the Quantitative Study of Heredity, or Genetics Without Individual Development. Walter Garstang, Gavin de Beer, and Richard Goldschmidt: The Concept of Changes in Individual Development as the Basis for Evolution. R.A. Fisher, J.B.S. Haldane, and Sewall Wright: The Genetics of Populations. Evolution: The Modern Synthesis and Its Failure to Incorporate Individual Development Into Evolutionary Theory. Extending the Modern Synthesis: Preliminaries to a Development Theory of the Phenotype (Phenogenesis). From Gene to Organism: The Developing Individual as an Emergent, Interactional, Hierarchical System. Induction of Behavioral Change in Individual Development as Prelude to Evolution: The Supragenetic Developmental Basis of Evolutionary Change.